The long holiday break quite literally came to a crashing halt as my head hit the ice on Cheney Lake with a sickening thud. It happened so fast. Five minutes earlier, my family and I were blissfully gliding around the oval with dozens of others taking advantage of an ideal winter afternoon. Then, thwack. 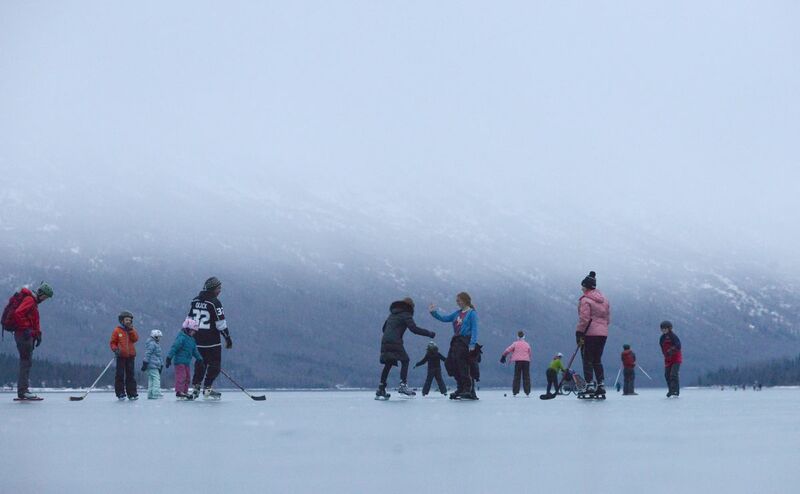 I'm not a bad skater, but I don't get out on Alaska's frozen lakes and ponds as much as I'd like. That fact undoubtedly contributed to my left foot failing to negotiate a patch of lumpy ice and swinging one way while my right foot slid the other. Down I went, seeing the flying birds and stars and all the other cartoon images one visualizes when her cranium smashes against something solid. The emergency room nurses were sympathetic. "You're not the first person we've seen today from ice skating," said the first, clicking a monitor on my forefinger. "Do you know where you are?" "Do you know who the president is?" queried another, laughing when I asked him not to make me answer that. I fielded questions about past head injuries, medications, allergies and insurance. Nobody, though, asked me if I had been wearing a helmet. I hadn't. None of us had. Helmets are considered compulsory equipment for most outdoor activities these days. I remember a time when people looked oddly at those in helmets, as if they were somehow announcing an unspoken limitation. The past several years, however, have changed both attitudes and impressions due to undeniable evidence that traumatic brain injuries, whether mild, moderate or severe, can have lasting consequences, particularly if suffered more than once. I have worn a helmet for biking, skiing, ice climbing and river rafting. But not ice skating. Curious, I put out a crowd-sourcing inquiry on Facebook, asking parents if helmets were part of their gear for skate outings. Responses varied, from the "Always a helmet, all the time," to "Gee, I never really thought about that. I never wore one as a kid," or "I know how to fall." 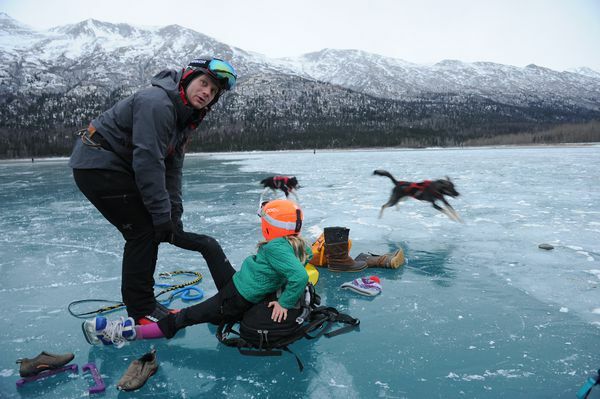 Rebecca Dotson of Eagle River said she and her daughter, 13, wear helmets when they skate. "I realized to fully justify my request and go beyond the knee-jerk 'because I say so' statement, I also need to wear (a helmet)," she said in an email. "Our health and safety is important and to teach her that I need to model it for her." Dotson said safety is an unspoken mantra in her circle of family and friends when they ice skate, roller blade, climb or otherwise enjoy their outdoor adventures. But she fully concedes that the "ugly helmet" conversation was an initial barrier. "I made sure it was a color and style that was appealing to take out that part of the argument," she said. 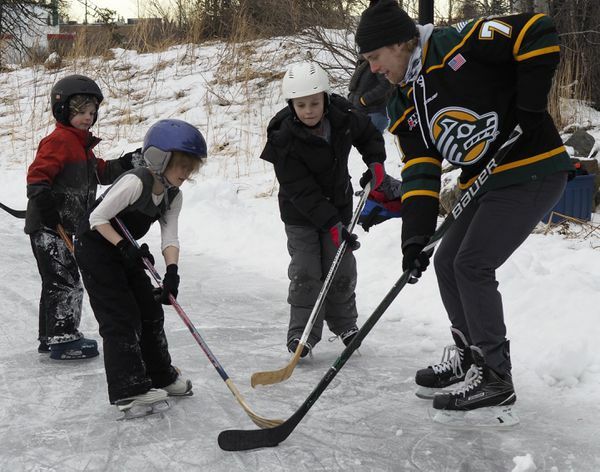 I made a few trips to outdoor rinks popular with kids and adults, standing on the shoreline and counting helmeted heads. From a purely unscientific tally, I saw about half the skaters wearing helmets, kids included. I also saw a lot of spills, a few of which made me close my eyes with a too-soon recall of my own accident. And no wonder. Dr. Jennifer Lombrano, an oral and maxillofacial surgeon with Alaska Trauma and Acute Care Surgery in Anchorage, gave me a quick tutorial about traumatic brain injuries while gently probing my jaw, which had also suffered in the fall. Lombrano trained with the U.S. Army and is a voice of experience when it comes to TBIs and their consequences. "Your brain is made of soft tissue and is cushioned by fluid, which means it can move around inside your skull or bang against it, which is not good," she said. My CAT scan showed an enormous hematoma that still makes me wince. It hurts like heck on the outside, but the real trouble, Lombrano said, occurs on the inside, when axons, long extensions of nerve cells that bundle together and send messages telling our bodies to act and think, are damaged or destroyed. Along with blood vessel damage, injury to axons is what leaves us with lingering symptoms. In children, this can manifest itself in different ways — headaches, dizziness, vomiting, blurry vision or extreme fatigue. With older kids, it's common to see irritability and other emotional reactions, including frustration with easy tasks. "Helmets are always good," said Lombrano. "They may not prevent (a concussion) but definitely minimize it and definitely help prevent skull fractures and scalp lacerations." Any snow-sport helmet will do, as long as there is a chin strap to keep it on your head. Bicycle helmets also work but don't keep you warm and don't cover the entire head and ears. Thad Woodard, an Anchorage pediatrician, has seen his share of head injuries and offered some advice. "If kids fall while skating and cry immediately, or get up and continue to act well after the fall, the likelihood of significant head injury is very low," he said. But, he said, monitor and pay attention to a worsening headache, weakness in a limb or the face, or unusual behavior. Some symptoms don't show up for 24 to 72 hours after an injury. An estimated 1.6 million to 3.8 million sports- and recreation-related concussions occur in the United States each year, according to the Brain Injury Research Institute. I'm one of the lucky ones; my symptoms lessen a bit each day. And a helmet has now joined my skates in the gear bag — for when I'm allowed on the ice again. For more information about traumatic brain injuries and concussions, check the websites for the Sports Concussion Institute and the Centers for Disease Control and Prevention. Erin Kirkland is author of the Alaska On the Go guidebook series and publisher of AKontheGO.com, a family travel and recreation resource.